Mac OS X 10.3 or higher, QuickTime 5.0.2 or higher. 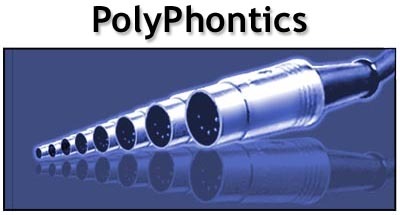 PolyPhontics is the only full-featured SoundFont and DLS editor available for Mac OS X. It has the features you need to create professional-quality SoundFont and DLS sound banks with minimal effort. Create DLS and SF2 files instantly. Create sound banks with unlimited samples and instruments. Extract samples from SoundFont and DLS files. Record and edit audio without leaving PolyPhontics. Access numerous synthesis parameters for maximum tonal control and hundreds of audio combinations. Preview your SoundFont(SF2) and Downloadable Sounds(DLS) files as you edit them! Import your favorite audio file formats, including AIF, WAV, and MP3. Easy-to-use interface has you up and running in minutes. Supports the latest SoundFont(SF2) and Downloadable Sounds(DLS) Specifications. Supports multisampling for realistic output.